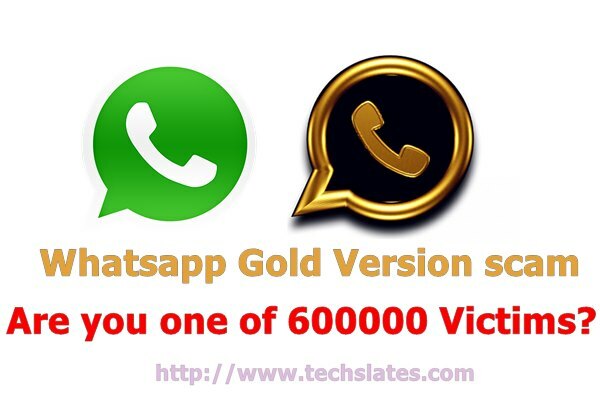 You are here: Home / Android / Whatsapp Gold Scam : Are you one of the 600000 victims? Whatsapp Gold Apk scam: Two days ago, I got a Wapp message. 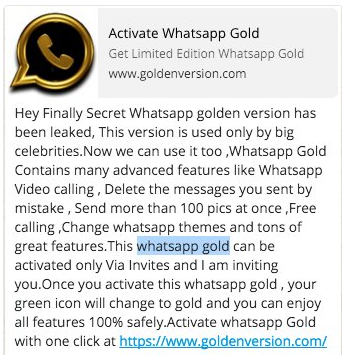 It says me to ‘Activate Whatsapp Gold version’. The spam message promote www goldenversion com site. I recommend you to ignore such download Whatsapp Gold apk edition scam messages. I am one of the victims of the Gold version of whatsapp. The message provokes you to download the golden whatsapp version. It also says that Golden version apk is a secret version available for only celebrities. This goldenversion scam of whatsapp is similar to arcticpilgrim spam and whatsapp plus scams. This Whatsapp Gold apk scam is also one of such malwares. The Whatsapp Gold edition supposed to have video calling feature activation. Till 25-may-2016, there is no whatsapp version available with this video calling feature. So, don’t believe in such Wapp updates or scams scuh as Whatsapp Gold apk version or arctic pilgrim scam. Techslates Whatsapp guides will let you know when the latest version with video calling feature is available for download. If you get such spam messages, don’t share the gold edition whatsapp message to your friends. In fact, Whatsapp , now a days is blocking the users who installed such Whatsapp gold malware. You cannot able to use the official whatsapp for 24 hours after uninstalling such Whatsapp malware. As of now, only voice calling is available in latest whatsapp version. Video calling is in testing phase. Sharing is caring, help your buddies by letting them know about this Whatsapp Gold version download spam.